The following is an archived copy of our March 2018 Shop Floor Automations newsletter. We celebrated 20 years contributing to USA manufacturing via our solutions. In 1998, we began as a reseller of Predator Software for the San Diego and Los Angeles areas. By 1999, we were the Number One Reseller of the software. Soon, we picked up other brands such as Scytec DataXchange and Ascendant Technologies. We also began to engineer a wide variety of hardware products to help customers across all industries to increase productivity, regardless if they had legacy machines or the latest CNC machines with Ethernet. 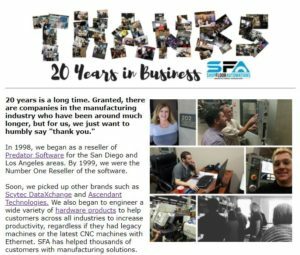 SFA has helped thousands of customers with manufacturing solutions. We have welcomed new employees of all ages over the years, and will never forget the loss of our co-founder, Shawn Dunne, who passed away in 2011. Our employees have had milestones of their own, such as getting married and having children. We have extended our reach across the United States, and have even taken on some International customers. To celebrate 20 years of business, enjoy discounts up to 20% on our online store! Better jump on it, as this sale will end May 1st. We invite you to grow with us! Call (877) 611-5825 for info on how to increase productivity and OEE. We would like to say an extra “thank you” by inviting you to take part in a contest! Prizes range from free support to free software. Visit our 20th-anniversary page for more information and for details on what winners will receive! Link to original newsletter post, or call us today! Subscribe to our newsletter today, or read past issues!